Taking classic texts and reinventing them into a musical form is old hat. From Kiss Me, Kate to West Side Story, works like these have stood the test of time. But one fellow who’s plays haven’t really had any musical reinventions is Anton Chekhov. His work is lauded and praised but not many have dared put music to his stories. In Songbird, Michael Kimmel and Lauren Pritchard ambitiously take Chekhov’s The Seagull and give it the musical treatment. Or is Songbird just a play with music? And that’s where the trouble begins. Written by Michael Kimmel with music and lyrics by Lauren Pritchard, the action from The Seagull is transported to present day Nashville where a country diva returns home as her songwriter son is about to debut a new song. When the diva ruins her sons performance, her trip of nostalgia is rerouted as the tortured writer tries to take his own life. Throw in an assortment of subplots and you get The Musical Seagull called Songbird. The trouble is, without previous knowledge of the source material, you’d be scratching your head trying to piece together a plot. Kimmel hits the beats of Chekhov’s story. He introduces the infamous moments. Dean, the Konstantin character, kills a bird, a bluebird here. Dean fails at suicide by hanging himself. Missy (the childhood best friend) loves Dean who loves Mia (the muse) who loves Beck (the famous songwriter) who loves Tammy Trip (the country diva and Dean’s momma). The spirit of Antony Chekhov is alive and well but when those beats aren’t present, all the characters do is talk about music and sing. The struggle of deciding whether this is a musical or a play with music defines how the songs play a part in the work. For the most part the show goes “I wrote a song, no one’s heard it, but I’m going to sing it right now for you.” Thematically the songs fit the mood of the Chekhovian moment but they do not propel the story. The characters don’t sing because they can no longer speak. They sing because they’re in Music City and country music is apparently the only pastime. Aside from drinking. Songbird feels very much as if Chekhov wrote an episode of “Nashville.” Don’t get me wrong, the series has been an ABC hit since 2012 but the parallels are uncanny. Though Tammy Trip, Beck, and Mia all talk about how Los Angeles is the music mecca, which seems strange since the country mecca, the Grand Ole Opry is just in town. It’s a shame that the structure of the text prevents Songbird from soaring because Lauren Pritchard’s music is something special. Pritchard is an incredible songwriter. Many of her songs could easily be played on contemporary country radio today. But when the music seems to have no correlation to the story, you have to wonder why not just listen to this all star cast in a concert? From the stunning ballads like “Cry Me a River” and “Again” to the power anthems like “Country Road”, Pritchard’s country score is the heart and soul of Songbird. Material aside, Songbird is stacked with talent. 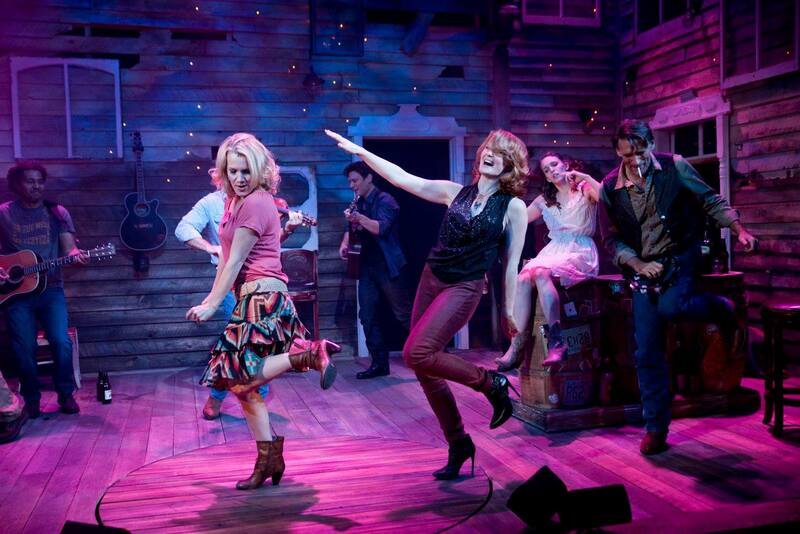 Every single cast member can not only sing, they can sing country music. Kate Baldwin epitomized diva as Tammy Trip. Baldwin had a pep in her two step. Trip struggled with doing what was right, staying with her son or going back to Los Angeles, and Baldwin’s battle is touching. Erin Dilly as the scene-stealing comic relief Pauline is quintessential Southern mamma. Dilly’s antics may read as campy in the scope of the play but it’s much desired. Dilly and Baldwin have wonderful chemistry, as if they never lost a beat. You almost wish Baldwin and Dilly’s Tammy and Pauline had a prequel completely unrelated to The Seagull. When it came to immense talent with nothing to do on stage, Kacie Sheik made her presence worth it. The characters seemed surprised at how well Sheik’s Missy could sing. Sheik’ soared with “Cry Me a River.” If Kimmel ever explores revisiting the piece and straying a little further from the source material, Missy’s arc could easily be expanded. As tortured soul Dean, Adam Cochran brooded from start to finish. Sure, it’s the character that Kimmel and Chekhov crafted but there was little variety. Except when he rocked out in Act II. The true songbird of the show was Ephie Aardema. As Mia, Aardema brought great range to the only character that seemed to have a full arc. Aardema’s vocals were something simply stunning. Finding the middle ground between Chekhovian humor and the musical theater approach seemed to be director JV Mercanti’s downfall. With the piece not knowing where it wanted to live, Mercanti could only do so much. There are natural tense and dramatic moments built in but the way Mercanti and his cast played it offered laughs in all the wrong ways. And it starts and ends with the bluebird. With no lead-up, Dean walks on stage with a wrapped bluebird. He and Mia have a brief chat and then he tosses it on the ground. And it stays there. For at least two songs. Sure, the tension is cut with the proclamation of inhibition but in the world of this play, it’s the excuse for everything. When it comes to compiling a design team to create a cohesive and beautiful design, Mercanti succeeded. The set by Jason Sherwood was evocative of a country western bar with rustic wood finishes and the tops of walls lined with empty beer and alcohol bottles. With the show transporting to various locations, Sherwood and lighting designer Aaron Porter transformed the space with ease. Though consistently looking at the string instruments hung on the wall knowing it’s only for easy actor access to randomly break out into song was a let down. The costumes by Mark Koss set the mood and represented the characters wonderfully. From the purity of Mia’s flowing garments to the dark tones of sad face Missy to the country diva leather of Tammy, Koss captured the essence. Not everything wants to be a musical and Songbird is proof of that. Kimmel and Pritchard’s ambitious piece is lost in the unknown. Once the team decides whether it’s a play with music or a musical, going back to the drawing board will allow the show to fly.